The front bodice piece of my new Heidi! 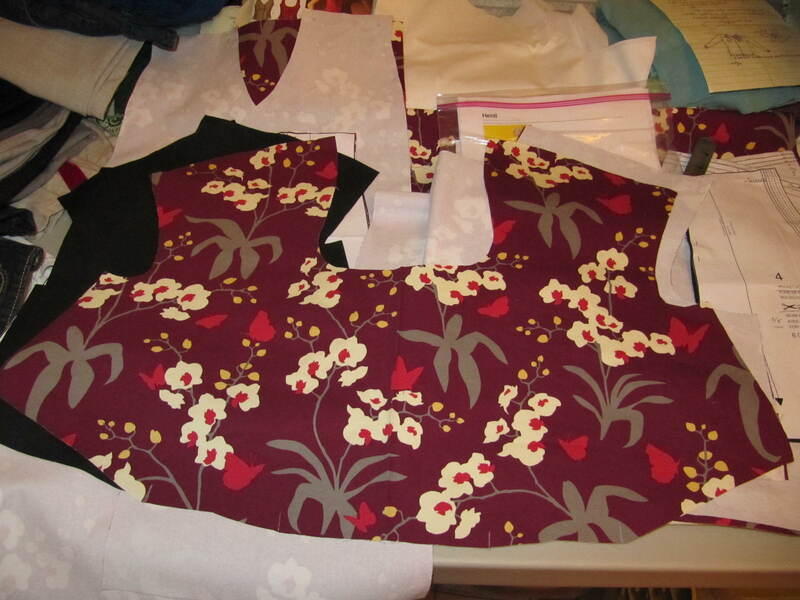 I recently cut out and began marking the pieces for my next BurdaStyle Heidi. 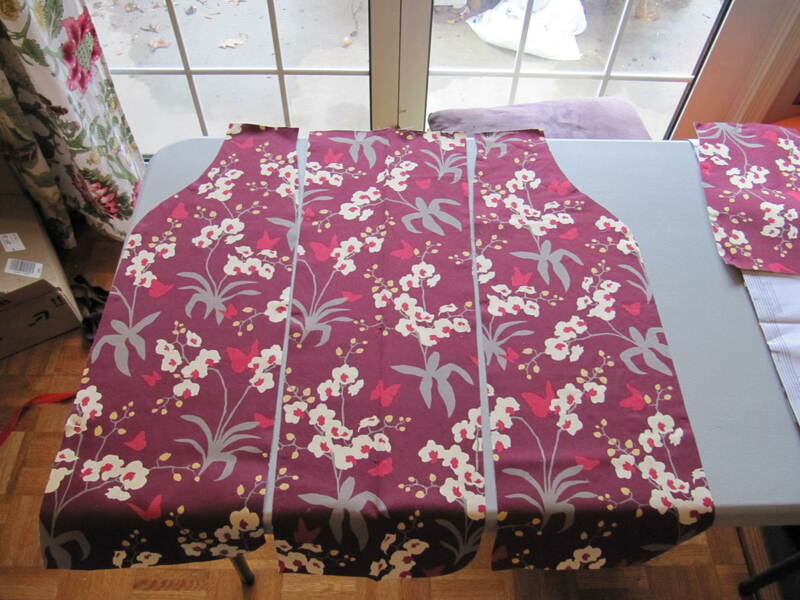 For this second version, I’m using a Joel Dewberry fabric: Orchid Mulberry. I love the base color–it’s just so yummy. Like jam! 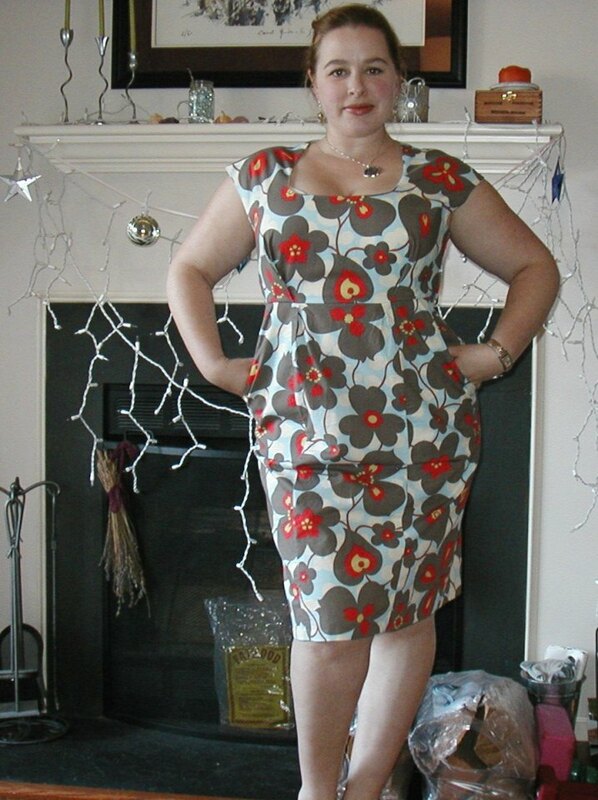 To add a little more pizazz to this version of the dress, I’m considering beading a pickstitch along the pocket edges. Nothing fancy, maybe a small colored wood bead, or plastic/glass seed bead. I don’t want to do too much, which I think would just detract from the beauty of the fabric’s design and the dress’s features. I’ll begin sewing it soon. The poly skirt lining still needs cutting out but as that’s one of the last piece attached to the dress, it can wait a little while. BurdaStyle Heidi Dress, #6016. 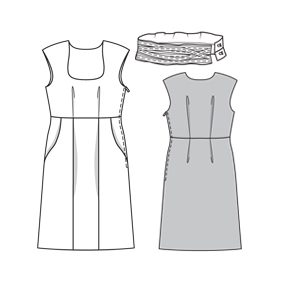 I first heard about BurdaStyle’s Heidi dress pattern from the A Dress A Day blog. Erin, A Dress A Day’s blogger, is absolutely obsessed with this pattern, and immediately I could see why. It’s a fantastic pattern! 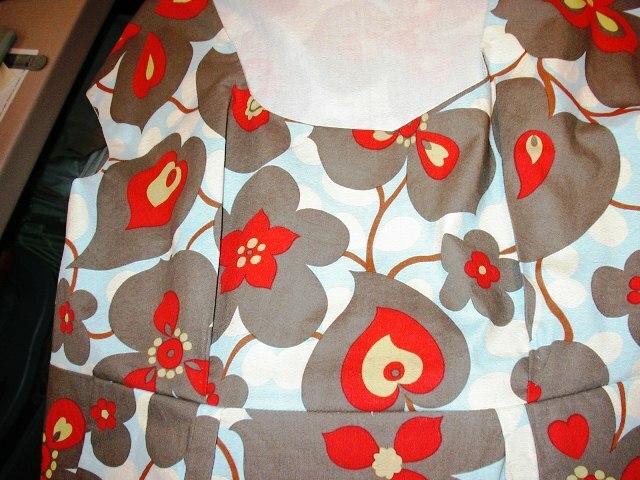 Look at the skirt seaming—those cute little waistline darts—the sort of keyhole scoop neckline! It really is lovely, and would look amazing in so many different fabrics: cotton for sundresses, light-weight wool for office wear, shantung or dupioni or satin for fancier occasions. I really took my time on my Heidi #1. I wanted to be sure it was wearable, perfectly fitted, and would last. It took me months to finish this dress, for a variety of reasons, but mostly because I didn’t want to screw it up! 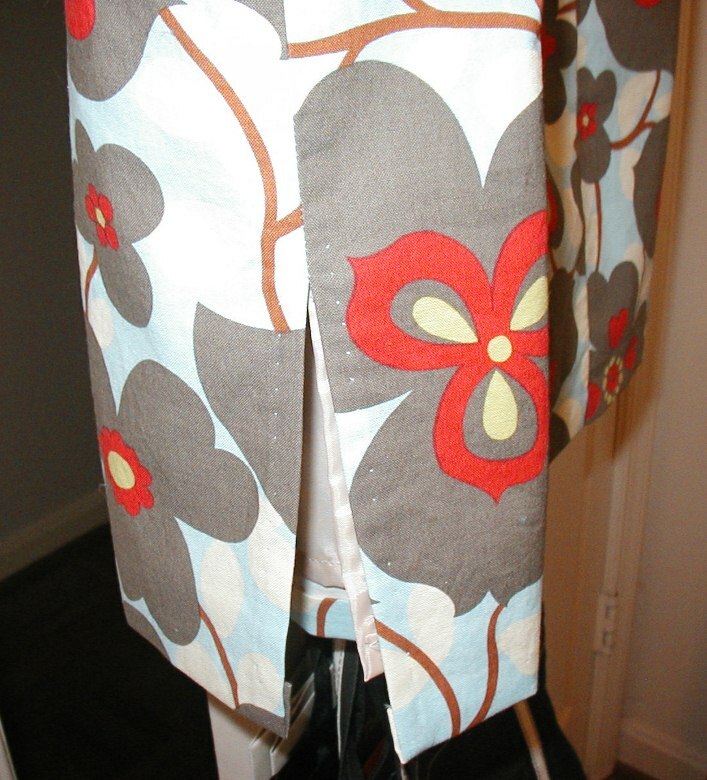 Likewise, when I came across Amy Butler’s Morning Glory fabric design, I also fell in love. It’s so pretty, and modern, and fun! When I finally decided to invest and order some yardage, I couldn’t find the color I originally wanted (can’t remember what it was now), so I settled on the second-best colorway, called linen. It reminds me of a blue sky studded with puffy cream clouds—as viewed from underneath a blossom-laden trellis perhaps. I just love that the blossoms are taupe with those pops of red and touches of mustard. 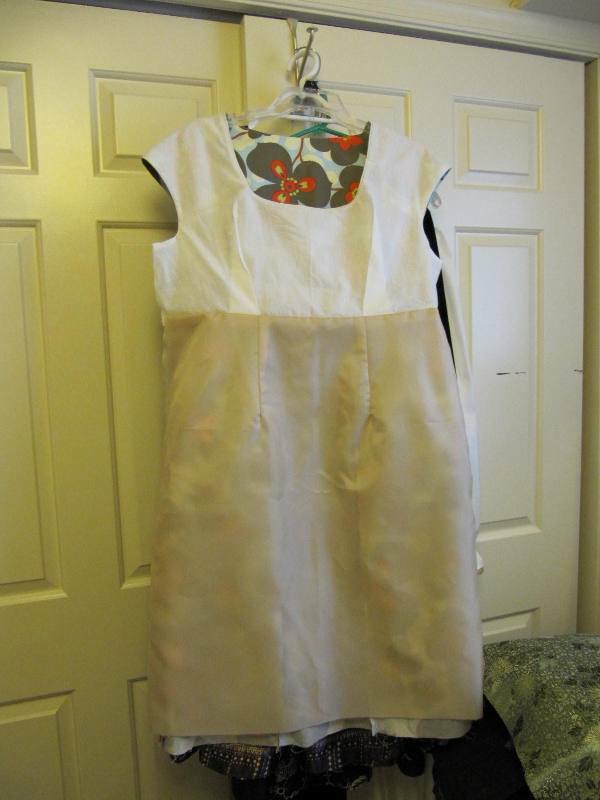 The bodice is lined in a light-weight muslin for breathability, with the skirt lining in poly. Heidi #1's interior: a cotton muslin bodice lining keeps it breathable and cool for summer, and poly skirt lining allows it to glide smoothly over tights for cooler months. For the pattern, I shortened the bodice by about 1 inch to accommodate my short torso, and it turned out very well. I had to take up the shoulder seams substantially to get the fit right—like almost 2 inches, possibly a bit more, from the normal size 46 shoulder seam. For easier walking, I added a walking vent on the right side (opposite side from the zipper opening). That’s the only thing this pattern really lacks. 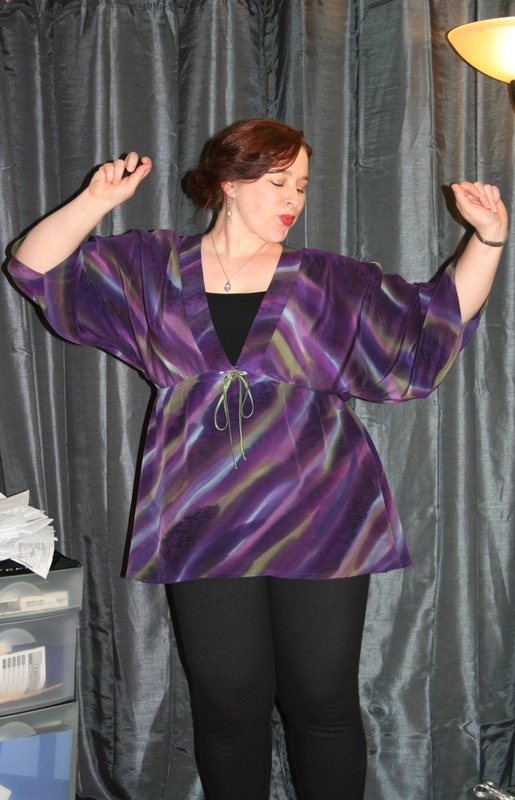 For my next version, I’ve raised the neckline by 1/2 inch for a little extra modesty. I’m well-endowed, and I don’t want to always have to wear a camisole or something to cover the girls. I’ve worn my #1 Heidi by now, and for my next versions I’m going to lower the waistline by 1/2 inch. I think I may have raised it a little too high for the first one, because I usually do have to. But the Heidi’s waistline is already situated a little above the natural waistline. So I overdid it. But whatever; it still works. Also, I’ve lowered the back neckline and trimmed down the shoulders by two sizes so I won’t have to take them up as much as I did in my #1. I’ve already cut out Heidi #2! 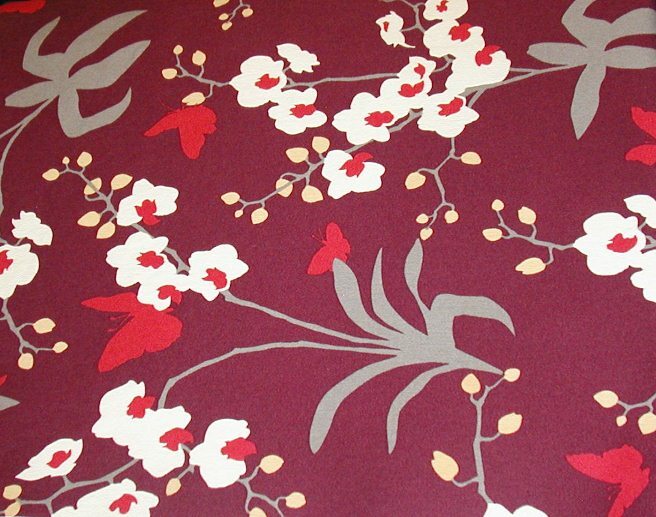 In a gorgeous mulberry colored, orchid-print Joel Dewberry fabric. Totally stolen from A Dress A Day’s very same Heidi using this fabric. But my mouth started watering the moment I saw the material made up with this pattern. And I had to have it!